Historian James Livingston has written an interesting piece for Aeon. In it, he asks “what is the value of work?” – a question given added urgency by the fact that, hanging just over the horizon, is a future where advances in AI and automation may wipe out a huge segment of job market. The conviction that there is a clear correspondence between effort and reward probably emerged on the pre-industrial American frontiers. Out in the hinterlands, the connection between hard work and economic return is always obvious. If you’re a farmer, the amount of food you harvest follows directly from the amount of seeds you sow, the work you put into building irrigation systems, and the time you spend tending your crops. Ranchers would have had more beef to sell if they spent more time watching their herds. For a fur trapper, supplies and money varied in proportion to the number of hides he could sell back to a company at the end of the season. Gold prospectors got more money out of mining more gold. 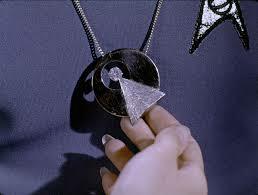 Today, the relationships are considerably more nebulous. Those who have had a lot of luck in life are quick to point to the efforts that preceded it. No doubt, those are causally efficacious, but they are hardly comprehensively explanatory. There are plenty of people who work hard and go nowhere. Likewise, there are even a few people who become wealthy beyond any coherent sense of proportion to the value they add to society. Was the work Lloyd Blankfein did in 2015 really worth over $23 million? Are there products circulating the globe whose value has been increased by $71.5 billion dollars by the efforts of Warren Buffett? Those questions are clearly rhetorical, because the objective answer is a flat, unequivocal “no”. To argue otherwise is to imbue markets with a sort mystic omnipotence, suggesting that the prices that emerge from economic transactions are always and everywhere reflective of their true value. Which is pure, unadulterated nonsense. There’s simply no way for economic agents to account for all the information that kind of computation would require. As a result, situations emerge where subsidiaries achieve market valuations in excess of their parent companies, or where an 86 year old man is worth $71.5 billion dollars despite never having invented a world-altering technology, discovered a lifesaving medical treatment, or even sold a piece of art. That people have profited immensely from grossly unethical – sometimes even outright criminal behavior – without ever suffering the slightest consequence suggests that the myth that human value is somehow reflected or enhanced by wages and net worth is not only misguided, but laughably deranged. Once, decades – maybe even centuries – ago, under certain conditions at the fringes of the industrialized world, that was true. Not any longer. Some people work hard and do pretty well for themselves. Others work just as hard and accrue riches greater than the GDPs of entire nations. Some work even harder – two jobs and brutal swing shifts – and can’t save enough to retire or afford health insurance. Desperate to preserve that crusty, ramshackle American ethos of rugged individualism and the self-made man, some might interject that surely, while it is possible to succeed tremendously or fail miserably despite your best efforts, it is also true that it is impossible to succeed at all without at least putting your shoulder to the wheel in the first place. For the most part, that’s probably true – but I would remind that misty-eyed romantic that there are people alive and wealthy today because a rich man’s sperm fertilized a rich woman’s egg – generations ago. 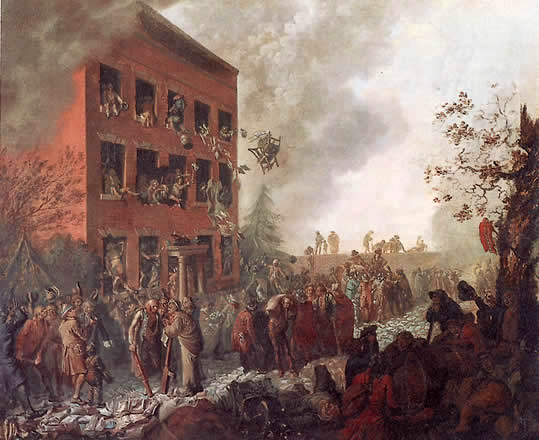 Johann Eckstein’s (1791) depiction of a mob burning Joseph Priestley’s home. Trophy hunting has recently become a sociopolitical lightning rod. With the high profile cases of Walter Palmer and Sabrina Corgatelli circulating through the headlines and echoing across social media, people are taking note of a form of recreation whose propriety is in need of serious evaluation. To the extent that this has drawn attention to issues of sportsmanship, fair chase, and conservation, it has been a positive development. However, these developments have also cast light on something rather ugly. Clamoring for justice and retribution, denizens of the internet’s most popular social media platforms have allowed their understandable feelings of disgust and outrage to coalesce into reactionary mobs. While I can sympathize with the underlying sentiment – the feeling that what these people have done is hideous and reprehensible – the response has been altogether baffling. Make no mistake: this type of behavior sets a precedent whose sinister implications are myriad. The potential for ideological allies to cohere into frenzied mobs – posting people’s personal information, calling for their termination at their place of employ – whenever they catch a whiff of dissension is something everyone should look at with sickening unease. The winds of righteous indignation can be rather indiscriminate. What sates one person’s lust for justice stands to infringe on another’s ability to achieve the same. The signal fact that nothing good has ever come from acquiescing to the demands of mobs should not be casually swept aside when you happen to find yourself agreeing with the base sentiments that stimulate a given mob’s rancor. Would it not seem an affront to the ideals of individual liberty and freedom of expression if Christians began to demand the termination of vociferous atheists? Would it seem appropriate if conservatives clogged the social media account of an organization upon learning that one of their employees had recently had an abortion? People will sometimes do things we don’t agree with. There will even be times when it might be possible to pose a strong argument that those things are unethical. But the idea that anytime someone offends the boundaries of someone else’s ideological sensibilities is a time we can expect the formation of digital witch hunts, bent on driving their targets from their place of work and leaving them no quarter anywhere in the public sphere, is truly abhorrent. People should feel free to debate ideas – even contentiously, when civility seems beyond reach. They should not, however, feel it their right to foist their ideas on others through the brute force of mob outrage. There are far more productive means of combating nefarious behaviors like trophy hunting. For instance, perhaps you might consider pouring all that emotional energy into an email to your congressman, demanding a ban on the import of trophies. Or maybe give a few bucks – as much as you can – to a reputable conservation agency and do your part in undermining the economic incentives associated with trophy hunting. Maybe the World Wildlife Fund, the National Geographic Society, or the National Wildlife Federation. It might not be a sure cure for your raised hackles, but it will definitely do more to help preserve the species the opponents of trophy hunting are concerned about protecting than getting a few individuals fired. Just don’t make it your mission to become the cosmic hand of justice. That’s never worked out well for anybody. 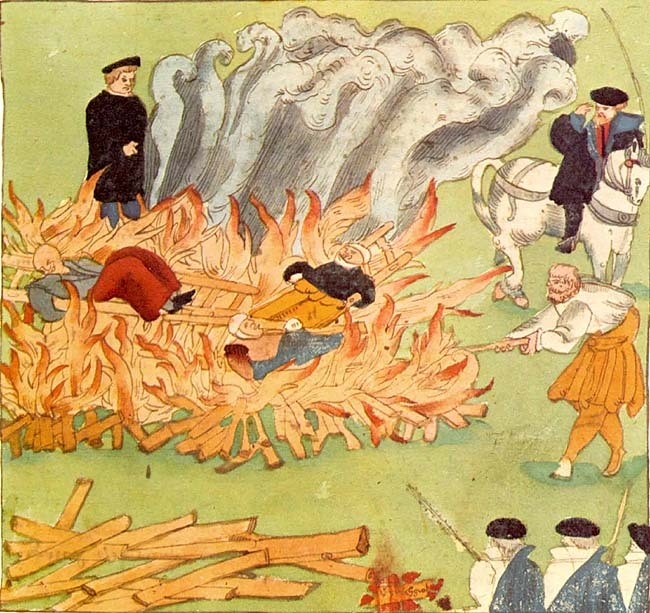 Johann Jacob Wick’s (1585) depiction of the burning of three witches in Switzerland.